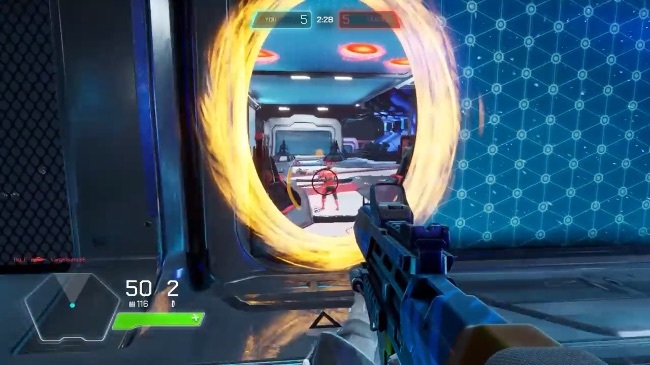 Last featured on Alpha Beta Gamer during the closed Alpha sign up, Splitgate: Arena Warfare is a glorious answer to the question – what would it be like if you could use a Portal Gun in a first person arena shooter? As you can imagine, it turns out the answer to that question is that it’d be a whole lot of fun! The portals behave exactly as they do in the Portal games, with you able to use a wrist mounted portal gun to place two portals which allow you (and anyone else) to travel through them. This allows for a wide variety of tactical options during combat. You can pass through them get the drop on an opponent, escape your imminent death or to use your momentum to propel you through the air. You don’t have to pass through them for them to be useful though – you can shoot through them, throw grenades through them or even fire a portal below where an enemy is standing to get them to come to you! It’s a remarkable game that adds a whole new dimension to the first person arena shooter. The versatility of the portal mechanics allow for so many different ways to get the drop on your enemies that it makes matches just as much about outsmarting your opponents than outshooting them. The next Beta is due to start at 12am PST today and will run until Midnight on April 14th. You can sign up via the link below for a chance to get into the Beta and we also have 100 Beta keys to give away. To claim your key just carry out any three actions in the giveaway widget below and your key will appear instantly (first come first served). Splitgate: Arena Warfare Alpha Key Giveaway!